A flexible full colour RGB LED light strip (HCOPTO0028). Each LED within the strip can be individually controlled to display any one of over 16 million colours. Each LED is connected in a serial chain meaning that each LED can be controlled with only one digital pin on a microcontroller. The strips are based on the WS2812 addressable RGB LEDs and are sold in with 30 LED strips or 5 meter reels. What's more, to make controlling these LED's from an Arduino as simple as possible we have written our own exclusive library what will handle all the complicated bits. See our forum or blog for more information on this library and requirements. RGB LEDS. The example will set each LED to a random colour. the first LED's Din pin to digital pin 8 of your Arduino. Both the shop description and the above post state that the length of a 30 LED strip is 50mm. Are they really this small? That's a typo. It should be 50cm not 50mm. I've corrected it in both places. Thanks. I'm having some issues setting up my [LINK REMOVED BY ADMIN]. I downloaded the library and uploaded the code to my Arduino Mega with no problems. I then connected the LED strip to PIN 12, Ground and 5V on the Arduino. Upon connecting and providing power, I noticed a few random LEDs blinking for a split second, then everything went dark and nothing else happened. The same random blink happened whenever I plugged the strip to Arduino's 5V. The Din of the strip needs to be connected to digital pin 8 on your Arduino. 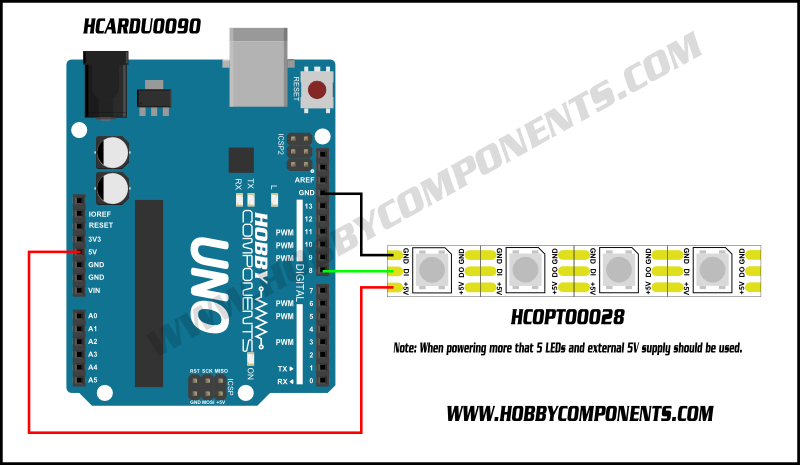 Hi, Has anyone tried running the HCOPTO0028 strip on a ATTiny85 such as found on the Adafruit trinket? I am guessing that the library HCWS2812.h will need to have the port modified from B0 (D8/pin14 on the 328p) to B4 (D4/pin5 (QFN chip)) if CLK is important, along with maximum driven LEDs value (although I nothing about writing library stuff) or can you just hook up to Digital pin 0 (Port B0-Pin11 QFN chip) instead of Digital pin 8 if not. Reason I ask is I have a small project I want to use the LEDs in and haven't the space to fit a 328p, which would also be over kill, as I need only the LED output pin and no other I/O. Although I can't say for sure without doing some sums, I think it is unlikely that a Tiny85 would be up to the job. The problem is the HCWS2812 requires very precise timings on the data signal (they must be with +/- 150ns if I remember correctly, that's 0.00000015s). This is just about doable on the ATMega328/2650/32u4 devices this library was written for but at best an ATTiny85 will only run at half the clock rate of these devices and I think it just wouldn't be fast enough to generate the data signals within the timing constraints. Has anybody had any success getting this strip to work with the Adafruit Huzzah Feather? The library suggests it is ESP2866 compatible, however it would not compile against the ADAFRUIT HUZZAH FEATHER board in Arduino IDE. "D2 not declared in this scope", I changed the line to #define DOUT_PIN 13. This then compiled, I connected the strip to pin 13 through a 74AHCT125 level shifter, but could not get the strip working. I have proven all the components work - LED strip (using Arduino), level shifter and feather. Do I need to use a different pin? Or am I missing anything else? Hi, thanks for the response - I did not see it had fallen onto 2nd page. This compiled, but after upload only the on board blue LED (on pin2 on Huzzah feather) would light up. The LED strip itself gave nothing.